There are a lot of really interesting things occuring in the commodity markets over the past few weeks. With extreme bearish sentiment leading to a nice mean reversion move in the grains, I think there is a possibility that we see something similar occur in Cotton over the intermediate term. 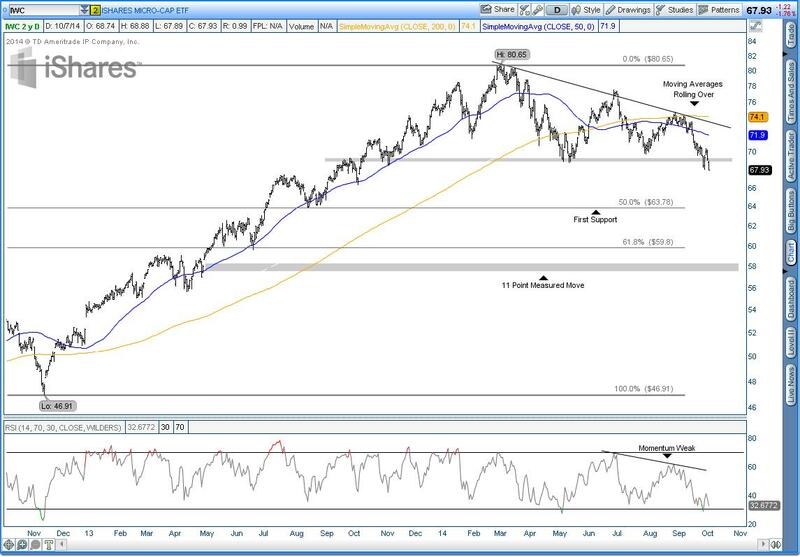 The place we want to start our analysis is the weekly chart, going back roughly 5 years. 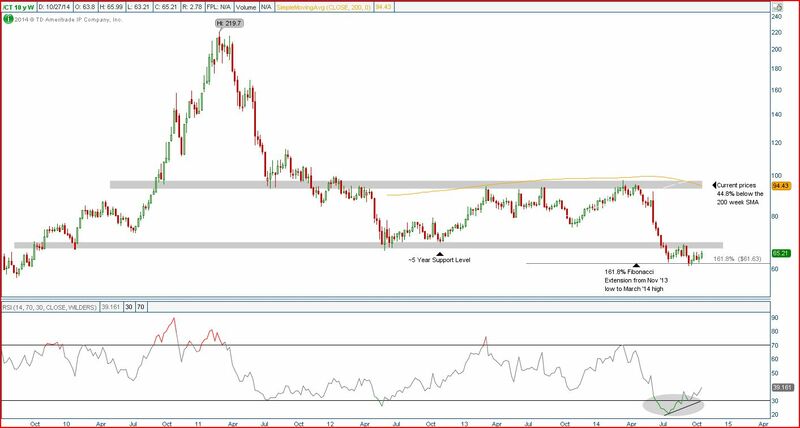 What’s important to us here is that Cotton, which had been rangebound since early 2012, broke below that range in July and has since started to form a base. After correcting ~36% off the early ’14 highs, we’re left with the question as to whether or not this base is a reversal or a pause in an otherwise clear downtrend. What I find interesting is that this consolidation is occuring at the 161.8% fibonacci extension of the November ’13 lows to the March ’14 highs. Additionally, we have a positive momentum divergence present and the time we’ve spent basing is long than I’d expect if this was a continuation of the prevailing downtrend. Lastly, from a mean reversion perspective, prices are currently ~45% below a declining 200 week simple moving average. To me, that is something that isn’t sustainable over the long term and the only way for that to correct is by prices moving higher, or through time. If we can get a weekly close above 68.50 to confirm this positive momentum divergence and false breakdown in price, I think we can head a lot higher. Strategy in One Sentence: Employing a Top-Down Technical Approach to create a portfolio of non-correlated assets with largely asymmetric risk/reward potential. First off, as a technician, my investment process does not involve any fundamental information about the underlying security. I focus on the price action of the security being analyzed and the behavior of the market itself. At the end of the day, it does not matter what a security should or shouldn’t do, but what it is actually doing in the market. Technical analysis introduces risk management into the picture by outlining levels where my analysis is wrong. As a market participant, I expect to be wrong, which is why I look for high risk/reward scenarios to add to the portfolio. The goal of my process is to construct a portfolio of non-correlated assets that currently have a risk/reward profile that is dramatically skewed in my favor. I work from a Top-Down Approach in that I try to identify broader themes present in various markets around the world and then drill down into individual securities to identify how best to take advantage of that theme while managing risk within the portfolio. Using a technical approach to markets I can analyze and participate in any market whether it be equities, commodities, currencies, fixed income, etc… Some of the factors important to my analysis include, but are not limited to; absolute and relative performance, momentum, sentiment and seasonality. Weekly Bar Chart: To identify how a chart looks structurally and remove any biases that may result from using secondary indicators from the getgo. Weekly Chart With Trendlines and Indicators: Once I’ve had an initial look at a security from a really high level, I begin to add trend lines and indicators to help quantify trend direction, momentum and identify common price patterns. Daily Candlestick Chart: If I determine that I like a security on a higher timeframe, I’ll move lower into the daily timeframe without any indicators to identify how the security is behaving in the more recent period, usually one year. Daily Candlestick Chart With Trendlines and Indicators: This daily chart is then marked up with trend lines and indicators to help identify levels where it makes sense to enter and exit a trade based on the rest of my thesis. Relative performance is an important part of my analysis because I want to be involved in assets where relative performance is either trending or at pivotal turning points where my risk/reward is clearly defined. Ratio Charts: When analyzing a security I’ll look at how it is performing relative to the broader market, its sector, an industry proxy or individual names in its peer group. This helps to identify the levels on which this particular security is showing relative strength or weakness. Ratio Charts With Trendlines and Indicators: Once I’ve identified how a ratio looks from a structural perspective, I’ll add trendlines and indicators to identify areas of support and resistance while watching for traditional chart patterns to develop. Momentum, as measured by the 14 period relative strength index, is a leading indicator that can offer helpful clues into the health of a price trend. I want to see momentum confirming price at new highs and lows and if it’s not, I can use this information to identify possible trend reversals. Divergences: Positive and negative divergences in momentum are often clues into a possible price reversal. If I am trying to identify a trend reversal or put on a counter trend trade, I need to see these divergences present in momentum. If I am trying to trade in the direction of the trend, I want momentum to confirm these new highs or lows. Bullish and Bearish Ranges: If a stock is trending higher, I want to see momentum stay in the top of its range > 50, and if it is trending lower, I want to see momentum stay in the bottom part of its range. < 50. Also, changes in bull/bear ranges occur when overbought/oversold conditions are hit. RSI can be applied to both absolute price charts and ratio charts. Sentiment is important because concensus can be right for a long time but are often wrong at extremes. I look at a few different indicators to gauge sentiment depending on what type of asset I am looking at. Given that this data is usually very volatile and noisey in the short term, I use historical averages as a measure to gague whether or not current readings are significant. Sentimentrader Data: Sentimentrader.com is a paid service that has great sentiment and seasonality data created by combining various options and futures data, surveys, etc… into a few aggregate values. I look for multi-year highs or lows in levels of optimism or pessimism before taking this data too seriously, as I said before that the data can be noisey. Short Interest: Short interest is the amount of shares sold short as a % of the float. I will look at this to identify situations where concensus may be overly bearish on a particular asset. This supplementary information allows me to identify areas where a short squeeze may occur. Days to Cover: Days to cover is calculated by taking the number of shares short and dividing it by the 10 day average volume for the stock. This helps to quantify the amount of demand there could be for the stock if a short squeeze was to insue. Sell Side Buys as a % of Coverage: By looking at the amount of sell side analysts that rate the security as a buy compared to the total number of analysts covering the security, I can gague how negative concensus is toward the security. If too many market participants are on the same side of the trade, eventually everyone who wants to sell has already sold and that may present a situation in which the risk/reward is skewed to the long side. Commitment of Traders Data: Commercial hedgers are referred to as “the smart money” which is why it is important to pay attention to their positioning by analyzing the commitment of traders data that comes out weekly. I’ll look for instances where these types of market participants are aggressively hedging or not hedging at all. Again, as with all sentiment data, there can be a lot of noise in the middle of these readings, but they can be important at extremes. Average Returns and Volatility: I look at monthly seasonal patterns within performance and volatility across all asset classes and securities I am interested in. This can be important from a portfolio management perpsective because this data may assist in market timing. For example, August and September tend to be weak months for the major US equity indices and there is normally a pickup in volatility during those months as well. Knowing that information allows me to make changes to the portfolio in an attempt to minimize my exposure to the weakness and volatility that historically occurs during this period. By combining the five above factors I am able to identify high risk/reward set ups and actively manage positions within the portfolio to maintain the goal of having a near zero correlation to the major asset classes. My analysis primarily looks for setups over the intermediate (3-6 months) and long term (over 1 year). If the facts change I’ll adjust the position as needed, but I primarily look for trades in that timeframe. If there is an event like an earnings announcement where I can’t define my risk then I’ll adjust the position to reduce risk into that event. All entries and exits outlined in the trade thesis will occur within the last hour of trading. This will ensure that I am not whipsawed in or out of a position on an intraday basis. The hard stop placed at -10% on all positions will be executed intraday if triggered during the session. Half a position will be taken on the initial entry and will be added to on strength. My maximum position size on entry is limited to 10% of the total portfolio value. Position size is based on a confidence interval putting a weight of 2% to each of the five major factors I look at. For each factor present in a trade setup, I add 2% to the position size. Obviously since I am picky with selecting trades so most position sizes will be in the 8%-10% range given I want to identify longer term themes with a number of the above factors present. Stops are outlined in the trade outline but a hard stop is placed at 10% on all trades to limit maximum losses on a trade to 1% of the portfolio at the largest position size. The portfolio can have no more than 25% gross exposure and 15% net exposure to any one sector or country (ex-US). Today I want to discuss the role of intermarket analysis in assessing the risk appetite of market participants. 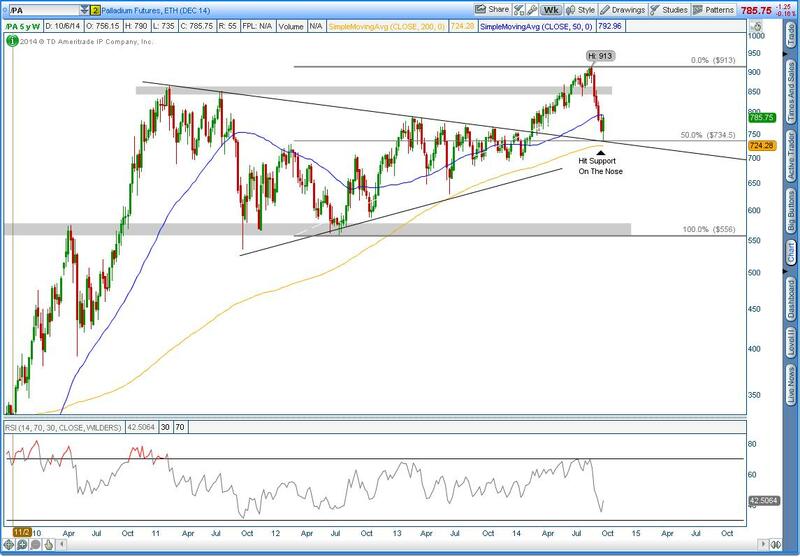 I’ll outline the charts I’m looking at across all asset classes and give my thoughts on them. I think US markets are structurally the best in town, but some of the technical damage we’ve seen develop year to date will take some time to repair itself. The first chart I want to look at is the S&P 500 versus the Emerging Markets ETF. This chart really highlights that even as I have been expressing concerns about US equities over the past few months and think that we’re due for continued volatility over the intermediate term, US equities are still the best game in town from a structural perspective. 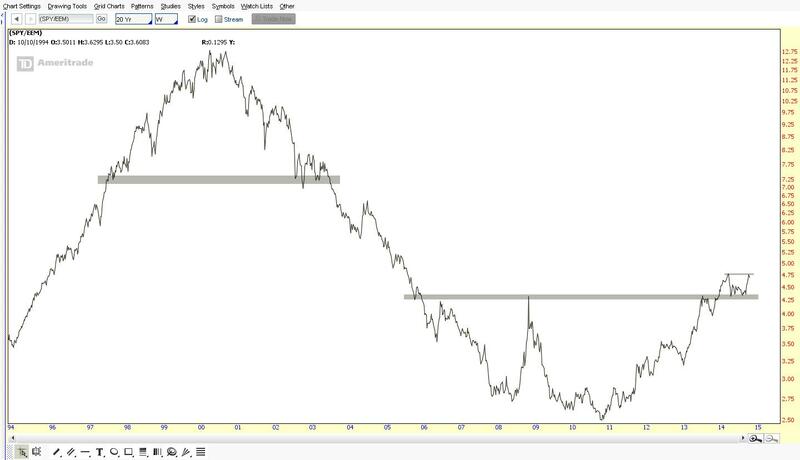 We have put in a long term rounding bottom against emerging market equities and as long as we stay above the gray shaded box, there is no reason that US equity market outperformance can’t continue. I’m going to begin with my favorite chart in the world, that being of palladium futures. What a beautiful test of support at the rising 200 week SMA, trend line resistance and 50% fibonacci retracement level. It doesn’t get much more textbook than that. As you all probably know, I dislike all precious metals from a structural perspective except for palladium. 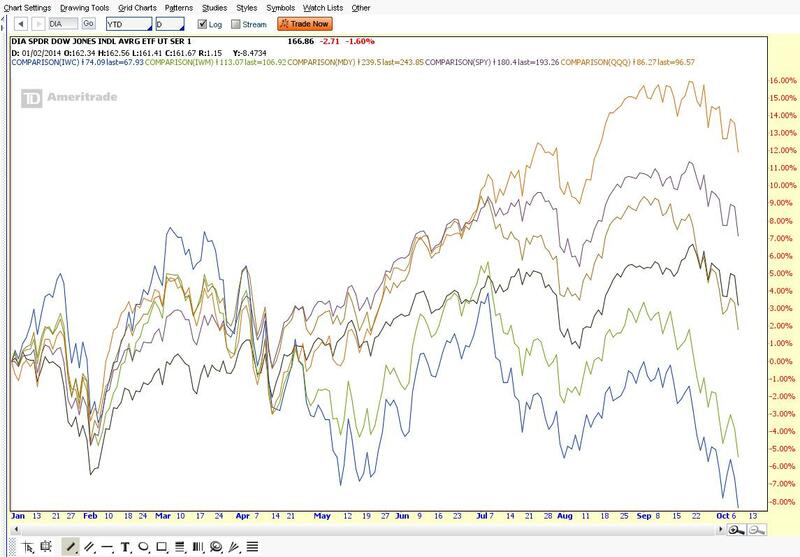 This chart is measuring the performance of microcaps, small caps, mid caps, the S&P 500, the Dow and the Nasdaq 100. As you can see performance is strongest in large caps and gets progressively worse as you move down the market capitalization spectrum. Not normally what you want to see if you’re long equities as this represents a defensive stance in the market and a lower risk appetite on the part of market participants. As you can see by the chart below, microcaps have lagged and are now breaking important support. The daily moving averages are rolling over as well, signaling that the trend is in the process of reversing and that rallies are likely to be sold. Additionally, momenutm continues to make lower highs and hit oversold levels, again not a good sign if you’re a bull. The measured move of this breakdown is 11 points, bringing us down to about 58, but there is some support around $63.75 that should provide some sort of a bounce. Small caps in a similar situation, looking to confirm a double top this week with the measured move targeting $94. Moving averages are rolling over and momentum is hitting oversold levels and remaining in a bearish range. The first target is at $99, the prior breakout area and 161.8% fibonacci extension from the high to low of this recent range. Not a great sign for the broader market if microcaps and small caps are breaking down, risk appetite is obviously a bit weak.